The sleek body style combined with either a rear spoiler or a diffuser combined with panels beneath the body help reduce the drag to increase fuel consumption. The special variable suspension automatically adapts to road conditions to provide an even smoother ride. The sound enhancement system increases the roar of the engine to get your adrenaline pumping. The Avalon features a 3.5-liter V6 engine that delivers 351 horsepower. Yet, it requires less fuel to function. The eight-speed transmission enhances the vehicle's ability to supply the power you need at various times. 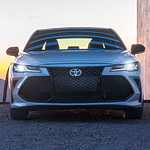 Get behind the wheel of a Toyota Avalon at Hixson Toyota and feel the power.